Your Israel story is waiting to begin. Fly from Boston on this adventure of lifetime for Tufts University students! 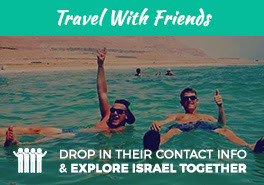 Go beyond experiencing the phenomenal culture, food, & vibes of Israel & spend 10 legendary days with the locals on this once-in-a-lifetime opportunity, where you’ll live it up in Israel with amazing people who will soon become your close friends back on campus. From exploring one-of-a-kind cities & cuisine with the best local flair to taking part in fun & gratifying hikes with inspiring views, there is so much for you to discover on this epic journey with us & your campus this summer! If you're ready for an experience that is dynamic, captivating, and unbelievable, now is the time for you to go. What's stopping you? "Shorashim was the perfect group to experience Israel with. This group was the reason I had an unforgetable time, from seven [Israelis] with me from the beginning, to seven new best friends at the end of the trip, I overall believe Shorashim was the right choice to travel with."